Thanks to alert reader Kit La Touche, I’ve now seen the actual article from Quentin Atkinson. It has lots of statistical detail, but doesn’t really answer my objections. There’s nothing at all about the sampling problem, nothing about historical trends if any in phoneme size, nothing to indicate he realizes that the Bantu explosion basicially erases most of African language diversity. Plus, though he mentions the idea that modern population size can’t be projected into the past, he doesn’t seem to realize that it may be entirely uncorrelated with ancient (> 15,000 years) population sizes. E.g. Mandarin doesn’t have a billion speakers today because it was a particularly large tribe in 13,000 BC. For most of our existence we were hunter-gatherers, and most languages probably didn’t exceed 500 speakers, except when a tribe could expand into virgin territory. Here’s his languages, which he gets from the WALS survey. I was worried that he was overrepresenting the Polynesian languages, but it seems not. On the other hand, some areas are strangely thin. There can’t be many Khoisan languages there, and quite a few areas are worryingly sparse: India, East Africa, southern Australia, North America. At one point he contrasts an analysis based on families, which suggests Africa as the origin, with one based on individual languages, which narrows it down to sub-Saharan Africa, especially the west. But dude, look at your map; you only have four data points in northern Africa, and only four on the east coast. And here’s his actual scatterplot, with legend. That’s an awfully, well, scattered distribution; note that his own analysis suggests that the distance from Africa accounts for just 19% of the variation. 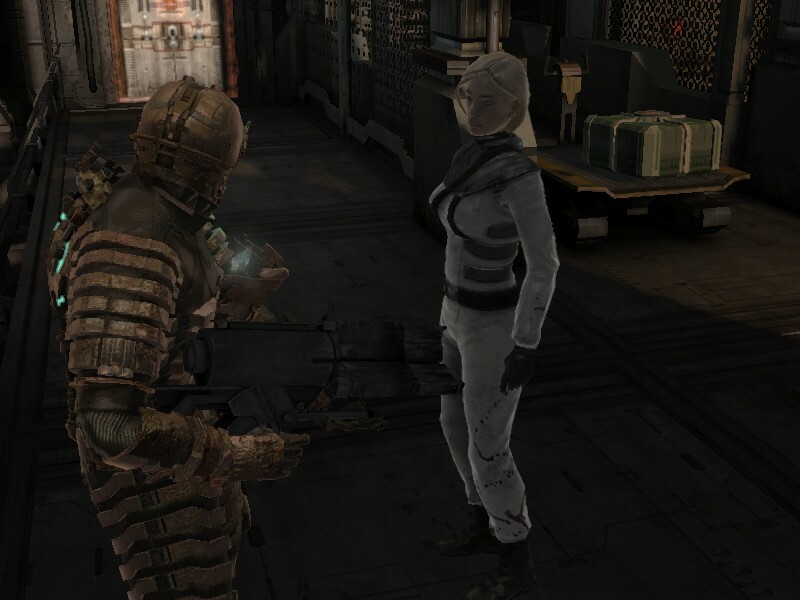 I finished Dead Space last night, and learned today that my friend Tieboy a.k.a Chris (here is his shiny new blog) hasn’t played it. Ha ha, Chris, I’ve played a game you haven’t! Also, in the few moments you actually see Isaac Clarke’s face, he looks a lot like Chris. I really liked it; it’s about the best single-player shooter since Half-Life 2. (That is, I’m excluding RPGs like the Bethesda and Bioware games.) It’s really good at the horror element… the necromorphs are creepy, even more so because you can see that they are ex-humans. And even more than HL2 they nail the scariness of living a nightmare– you pause before entering any new area or more open area and make sure you’ve reloaded, because bad things are out there. Things jump out at you; things scuttle around on the ceiling and hunt you; things re-appear in areas you’d cleared. And it’s pretty cool that the game does not pause when you check inventory or the map. It loses on the comparison to HL2 in terms of writing and plausibility. 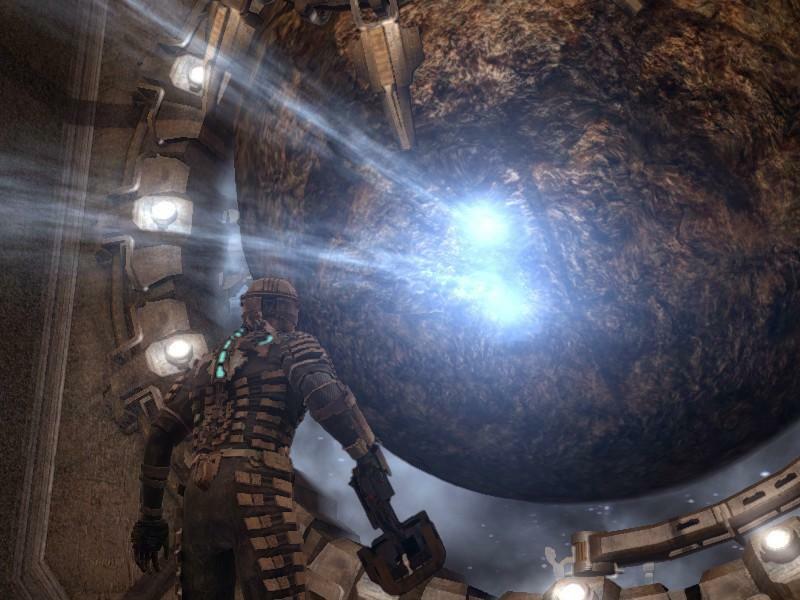 Every chapter is of the form “Someone makes Isaac wander through monster-infected areas of the ship to fix or fetch things that are scattered as widely as possible.” Take that asteroid up there. That’s your rescue beacon. OK, sure, but why? Why not, you know, a little rocket? Or, there’s one section where you have to blow up incoming asteroids. Why park this ship in an orbit where random debris will destroy it in three minutes if you don’t have a cannon constantly operating? Or, you have to go fetch some nav cards, because… jeez, I have no idea, what is a nav card? These things are not terrible; I just think Valve is better at making the levels seem like a coherent story. I ended up relying almost entirely on the plasma cutter and pulse rifle. I didn’t need anything else on Easy, and I never could figure out a use for the contact beam, and I never found a line gun. I still kind of don’t like the upgrade system… you basically can only fully upgrade one item, a system which discourages experimentation. Oh, and not being able to save when you like is dumb. You don’t restart at your last savepoint when you die anyway, so what would be the problem with being able to save at any time you are not in combat? For variety, there are zero-g and occasional no-air environments, plus a stasis module that slows devices or monsters down (this is fun, though there are times you are screwed if you’re low on charges for it), plus a kinesis module (which is pretty much a gravity gun). I think the zero-g sections would have been more fun if Isaac didn’t have magnetic boots; as it is he’s still walking on a surface, which doesn’t exactly feel zero-g.
My major complaint is with the overall plot. I finished the game thinking what the hell? (SPOILERS AHEAD.) For one thing, I’m not sure it’s a great idea to undermine your avatar… Isaac sees his girlfriend Nicole several times, only she’s dead (as we learn in a really disturbing movie). But she was, well, helping him with electronics, in one case across a hallway Isaac can’t jump across… what is supposed to have been happening there? I see her too, shes right there! And then there’s the Marker. You’re told you have to bring it back to the planet in order to stop the plague, and because Isaac does everything he’s told, he does. Then his shipmate Kendra starts taking it back, because she’s a scumbag and wants it for… um… something. And then you defeat the Hive Mind another way, never replacing the Marker. So was it important or not? Was moving the marker back a good idea, or a horrible idea, or a complete red herring? I have no idea. Well, here’s the article in the Economist, and the scientific paper. The short version is, a professor at the University of Auckland in New Zealand has taken about 500 modern languages and applied the theory of the founder effect to them, positing that the most recently diverged languages will have fewer phonemes than older languages. The finding is that language originated somewhere in Africa, big surprise. This sounds an awful lot like another attempt at “mass comparison” to me, so I thought I’d ask what a real internet linguist thinks of the issue. Do phonemes even exhibit the founder effect? I thought that was mainly something that happened with entire words, not fundamentals of words. Unfortunately the Science article is subscriber-only, so I’m relying on the Economist summary. And from that, it looks barmy to me. But for all I know, the real article addresses my concerns. It has been known for a while that the less widely spoken a language is, the fewer the phonemes it has. How firmly do we ‘know’ this? The highest number of phonemes are found in some Khoisan languages, with very small numbers of speakers; the Caucasian languages are also notoriously consonant-happy. Languages vary so much that sampling is a real issue. Atkinson is taking 504 languages; that’s about 1/10 of the total. Is that a random sample? Almost certainly not; as I’ve found in researching my numbers list, getting information about all languages is a very difficult project. So very likely he’s using the most readily available sources— which are going to be biased toward the most spoken languages. That’s pretty much guaranteed to screw up looking at the # phonemes /# speakers correlation, as several thousand less-studied, low-#-speaker languages are left out. Here’s a paper that discusses the supposed correlation more closely; note that the researcher uses the UPSID database, which will be subject to the most-studied problem; also that the actual scatterplots are very loose; the correlation may be significant but it’s obviously not the most significant factor. So, as groups of people ventured ever farther from their African homeland, their phonemic repertoires should have dwindled, just as their genetic ones did. OK, forget population size then. It looks like all he did was plot # phonemes vs. distance from Africa anyway. But his thesis depends on the idea that number of phonemes decreases over time. First, how could this be tested by looking at contemporary languages anyway? He has to be asserting that somehow African languages preserve their phonemes more… why would they? Do the phonemes get lost in transit? Do languages really lose phonemes over time? To evaluate that we have to look at language over time, not over geographic areas. As just one data point, Latin had about 24 phonemes; French has about 38. Old English had about 32, modern English around 39. I’d be really surprised if there were actually a strong tendency to lose phonemes over time. We’ve been speaking for 50,000 years; if there were such a tendency we should all have languages with minimal inventories, like Rotokas. I would expect there to be countervailing tendencies that restore the number of phonemes. Charlie Stross has been answering questions on his blog. I like Stross for taking reasoned, often contrarian positions on SF conundrums, and one of his answers was particularly arresting. Someone asked what he’d do if he had an AI at his disposal for one hour which could think ten lifetimes’ worth of thoughts. But (as he says in the ellipses) it’s not just scale; it’s that thinking isn’t the only thing you need to do in science… and therefore that a thinking machine is not what it’s cracked up to be. A research team doesn’t sit down and think for years on end; it has to go out at least sometimes to test hypotheses, build prototypes, gather data. Even a theoretical physicist has to wait for theories to be tested to see what trains of thought are reasonable. All of this makes me more comfortable in my assertion that human-level AIs are a bad idea. Something sitting in a box thinking is not a replacement for human beings, and not even that useful if it can retain computer-like speeds even as it handles human-level intelligence. Yglesias has an excellent reminder not to get too excited about long-term budget plans. We have a long-term problem and the obvious solution is a long-term plan. But the obvious solution is wrong. Nothing Congress does today will determine what the budget is in 2031, because Congress can override that in 2021-2030. That’s part of why Ryan’s plan is such a cheat: it hands $3 trillion in cuts to the rich right now, to be paid for by vague spending cuts ten years down the road. Seriously, you’re a Congressman in 2031 and seniors are howling about Ryan’s benefit cuts: you’re going to be constrained by Ryan-from-20-years-ago? Certainly not, any more than Ryan feels constrained by anything Congress did in 1991. This isn’t speculation, it’s just history. We had a balanced budget in 2000, carefully established after years of work by Clinton and his congressional allies. It was destroyed in a few short years by his successor. The paradox is that if Congress does nothing, then we actually come close to a balanced budget. Bush’s deficit-pumping tax cuts are scheduled to expire in 2012; we’re leaving Iraq; there are other things like the ‘doc fix’ that would expire if Congress didn’t act. Doing nothing is not the best plan; the irony is that it’s better than what is likely to actually get enacted, because the Republicans are going to insist on worsening the deficit with tax cuts.